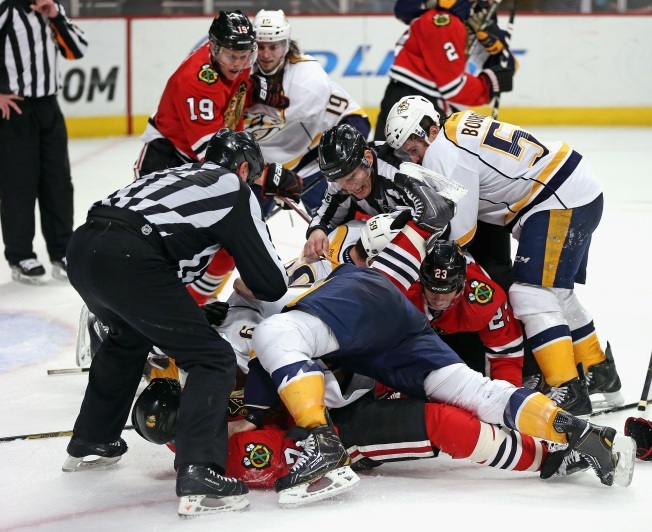 It appears the Nashville Predators don't want Blackhawks fans at their arena during this year's Stanley Cup Playoffs. Two years ago Bears fans invaded downtown Nashville, drank them dry and took over the Titans' stadium. Five years ago Blackhawks fans took over Bridgestone Arena en route to a Stanley Cup Playoff series win. "I can't tell you how many games on the road felt like home games," said Blackhawks head coach Joel Quenneville. Even this past December, Blackhawks fans counted in at more than 5,000 in Nashville, storming Bridgestone Arena as the Hawks defeated the Predators on their home ice. "Fans on the road are unbelievable," said Hawks forward Kris Versteeg. It's no surprise then that the Predators are putting their sticks down on Blackhawk fans, searching for ways to keep them from buying any playoff tickets in Nashville. As it stands, the Hawks could meet the Predators in the first round of the playoffs. Predators playoff tickets go on sale this weekend. The tickets will be available Saturday at Kroger stores only in Tennessee and Sunday at Bridgestone Arena in Tennessee, according to the Tennessean. Monday you can buy tickets online, but only if you have a Tennessee zip code. "You'd like home ice but if not, that's okay," said Quenneville. The Blackhawks don't have an out-of-town ticket policy and they don't need one with 313 consecutive sellouts at the United Center. Looks like Blackhawks fans will need to find friends in Nashville to buy Tennessee playoff tickets.